When I took the podium to accept my award, I began just like those fancy Hollywood actors. But first, full disclosure: this was not that hyped-up Oscar ceremony where you have to wear a tux and navigate the paparazzi. And there were no swag bags or wild after-parties. I call it my Academy Award because the “2018 UCLA Extension Distinguished Instructor award” is way too long to be a title. My trophy was for the best instructor performance in the category of Engineering and Technology, chosen out of 2,000 total Extension instructors. 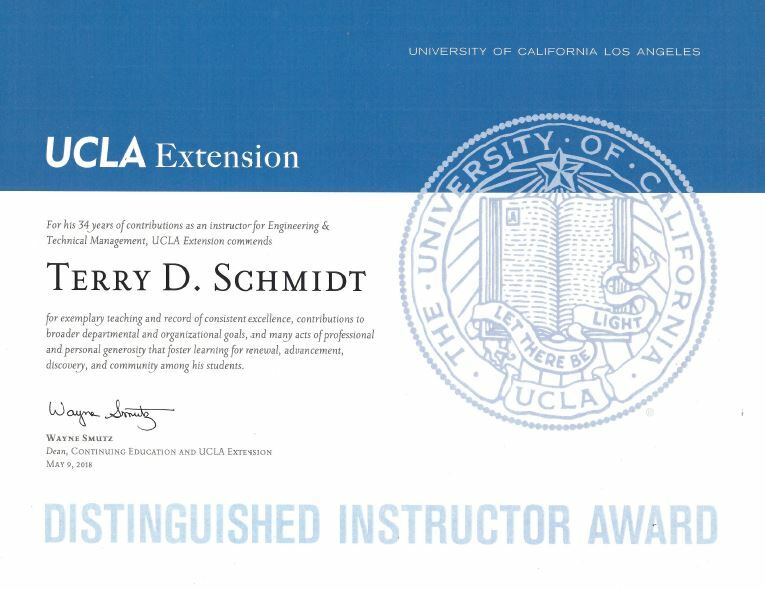 Some background: Since 1986, I have taught on campus or on-site short courses through UCLA Extension in my expertise areas — strategic thinking, strategic project management, personal reinvention, and career/life planning. I love this gig because I every single person enrolls to better themselves, and I get to learn about industry issues and what’s not working, along with their personal hopes, fears, and dreams. This sounds paradoxical to high achievers but If you play this game, you set yourself up for disappointment. There’s always somebody smarter, faster, better looking, or luckier than you. Focus on developing your very best potential. that’s a game you can win. 2. Go for what you want! Get clear about your goals. Write them down – think it and ink it. Diversify your goal portfolio with personal, family, financial, career, relationship, fun, toys, community, spiritual and whatever goals. Start with the rocking chair test… Imagine at age 95, looking back on a successful life, what would you be most proud of doing, being, and having? Think like a one-person business enterprise, because you are. Your company is your current customer, you deliver services, you have competition. Think like a business. Start with a purpose statement, AKA your personal mission. Manage your functions– marketing, service delivery, finance, R&D (learning), human resources, technology — like the hotshot CEO you know yourself to be. Sure, you’re a great systems engineer, but so are 50,000 others and you all look the same. Don’t be a commodity. Differentiate yourself. Stand out from the crowd by adding skills outside of your main domain. The systems engineer who also builds incredible teams will always be in demand. Make 30% of your learning outside of your main field. Hybridize yourself. It’s so easy to crap all over ourselves, especially after setbacks. Hey, self, cut yourself some slack. Sure, do your best, but when it doesn’t work out, don’t beat yourself up. Learn and get better. When you F.A.I.L., spell it out right — First Attempt in Learning. Tune into your self-talk, and watch your h your wild Monkey Mind in action. Notice that most of the messages internally voice are self-putdowns, doubt and criticism? Think about it …if you spoke this way to your friends, you wouldn’t have any! Upgrade your internal messaging to be supportive and self-inspiring. Are the people around you going for their dreams in life, or are they negative and cynical? Does your circle of friends and colleagues uplift and support you? And do you do the same for them? Build up a network of positive, cheerleading friends. Painful as it may seem, you may need to back away from the putter-downers and drama kings currently in your life. Wish them well, love them, but protect your spirit. The best way to achieve your dreams is to help others reach theirs. When you do make a positive contribution to others, you empower yourself. Pay it forward because what goes around comes around. Start taking action! The universe rewards action. Sitting back, waiting for the perfect time weakens your self-esteem muscles. What can you do today that has a fast-forward ripple effect on your future? To learn the Super Power strategies I teach, click here to register for my one hour Project Super Power System training at no cost.